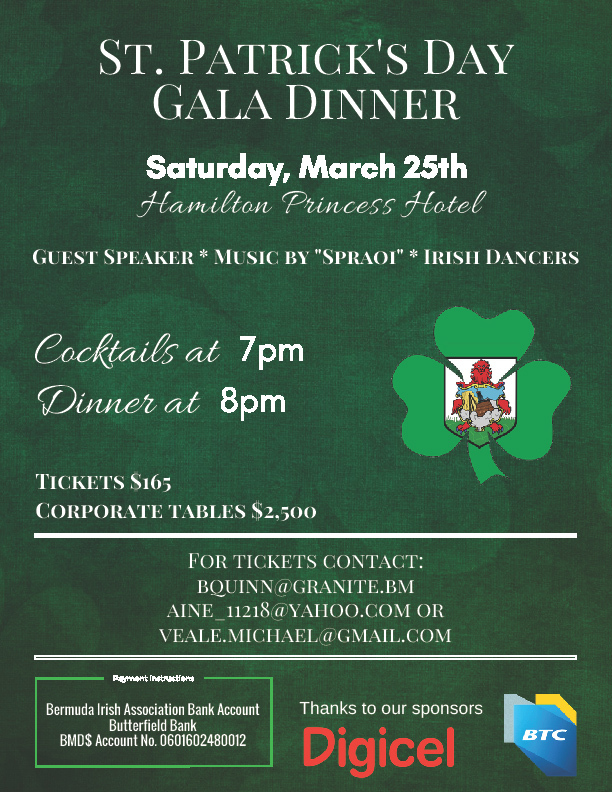 “As a special offer in support of the event, the Hamilton Princess are providing a reduced room rate of $249 per night for attendees at the function, just mention the BIA dinner to get the rate. “Finally in addition to generous lead sponsorship again from Digicel/BTC we have also again received band sponsorship from Goslings representing Guinness and Jameson on Island and Docksiders Pub & Restaurant. The band will also be playing a short warm up concert in Docksiders on the 24th. Tickets to the event cost $165 per person, or $2,500 for a corporate table, please email bquinn@granite.bm, aine_11218@yahoo.com or veale.michael©gmail.com. While people go out and play at $165 a plate sends a message to the tax collector that all is well to increase taxes.